I looked at this picture and it was like a light bulb going off. Just kidding – I looked at it and drew a blank. It’s a lovely fixture on a lovely ceiling and then it hit me. It’s all about the details. “Imagine the work that went into crafting that chandelier. 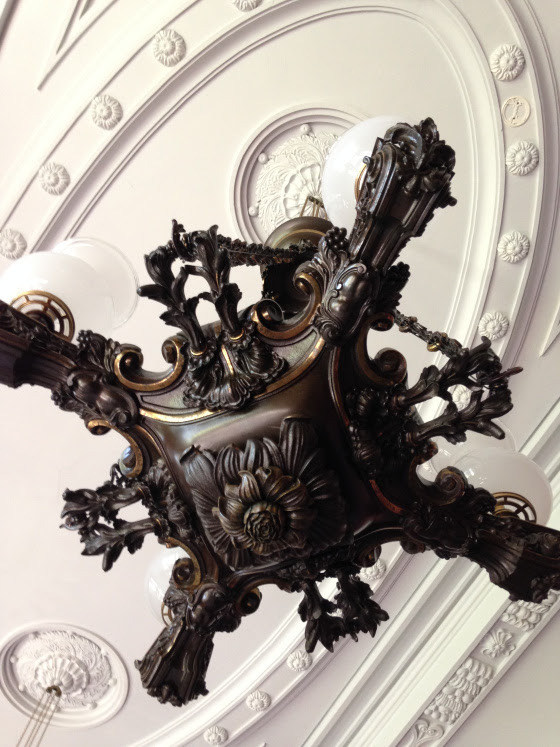 And those rosettes with the ornate moldings – that’s the original plaster.” Sharon looked up in awe at the ceiling. “Mm-hmm. Lovely” Kevin said. He wasn’t really interested in old architecture, but he always tagged along on her tours. Turning around, she saw him on one knee, ring sparkling in the light. Dust motes danced as she spun around again, nodding through her tears. 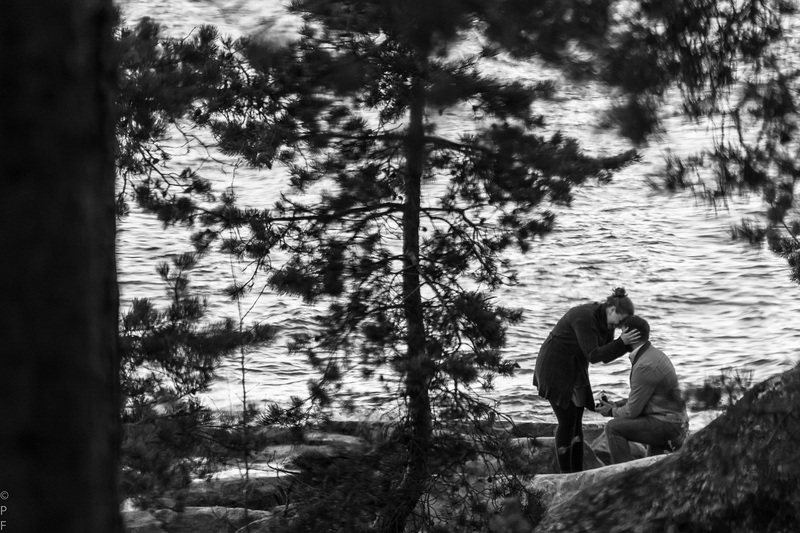 My son recently proposed to his lovely girlfriend in Finland and while it wasn’t done exactly as above, he did wait until she was distracted to get down on one knee. The photo below captures the exact moment she realized what was happening. Cheers to them! Thanks, Karyn. I find it takes a while with some photos. Other times, the story just walks up and taps you on the shoulder. Aw, Sweet story and good news to go with it. Congratulations. Thanks, Rochelle! We are very excited for them both!! How truly lovely, and the story that led you to this. Love it. Congratulations to you and your son! Thank you for reading and for your kind words! Another wedding in the family will be fun. How did they get that photo? Its quite a treasure. My son arranged for a friend to be on hand, taking pictures. He then took portraits of them right after. Makes it even more magical to be ‘right there’ with them. Sounds like a planned tour by Kevin, nicely done. And congratulations to your son and his fiancee. Thank you – both for reading and your kind words! Thanks, Dawn! The wedding will be in Finland, so a big trip for all of us next summer. What fun! What a spectacular place to go! My daughter is having my first grandbaby in Israel this summer, and getting married there next spring… So happy, but wish it was closer. 😉 Again, Mazel! First, congratulations on the upcoming nuptials for your offspring. Second, I like how you took the prompt and wove a story by combining it with news from your own family. Isn’t that the way inspiration works? Thank you – believe it or not, the story came to me first and then I realized I could share the news about my son. My subconscious worked it out before I did. Made me smile. Thanks and congratulations to your son.